MEL WLLIAMS is an artist living and working in Worcestershire. In 2011 she took part in the five-day Go Ghana! Cycle Challenge, riding 240 miles in intense heat from the slave fort of Elmina to the rural plateau of Kwahu, to raise money for clean drinking water in Kwahu Tafo. On the evening before the cyclists set off, she chanced to witness the transfixing beauty of the fishermen of Elmina putting out to sea in the evening light, and was inspired to undertake the collection of paintings which form the basis of her contribution to COLOURS OF GHANA. 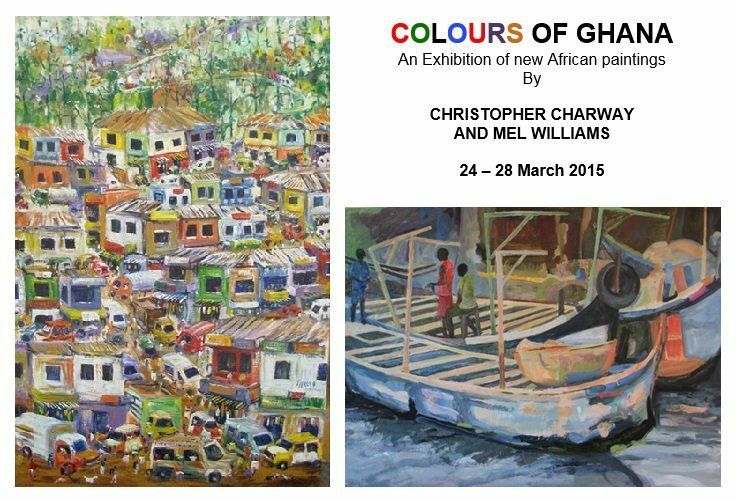 CHRISTOPHER CHARWAY is a Ghanaian artist who lives in Accra. He has exhibited widely in Ghana and in 2000 was awarded a Gold Medal at the 17th World Quality Commitment Convention in Detroit. A sought-after painter accustomed to portraying the urban and fishing scenes of his own locality, he was freshly inspired at Easter 2014 by an invitation from Friends of Tafo to visit Kwahu, a little-known area of dramatic natural beauty and untouched cultural traditions in the Eastern Region of Ghana. in tribute to FOT’s development work in the impoverished rural community.